First off, let me apologize for this post being up three days late. I have been legitimately, awfully sick. I had a cold six or so weeks ago which turned into bronchitis and my poor body finally gave up in disgust last Friday. I've spent the last six days struggling with basic things like making sure my toddler doesn't climb up the bookshelves and remembering to brush my teeth. I have not felt this genuinely awful since Owen was freshly born. Yikes. This week I want to chat a bit about Border 6, as promised last week, and we will talk about cutting the pieces for Border 7. 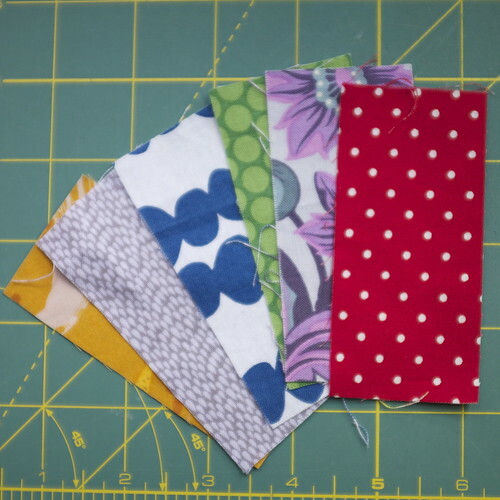 These are some of the fabric choices I auditioned for Border 6. 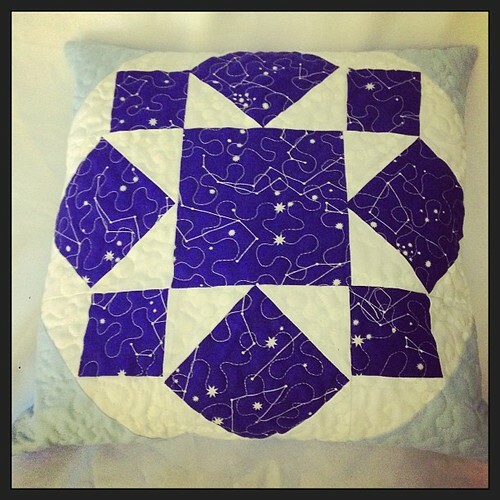 Constellations, Constellations, Waterfront Park, Waterfront Park, Rain Basics, Constellations. 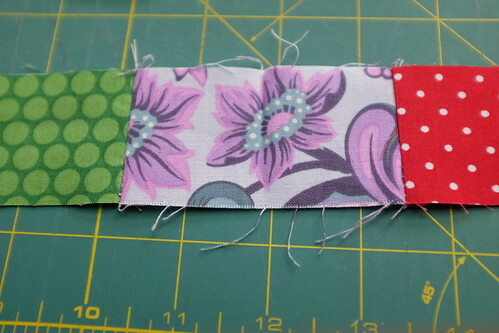 Because Border 6 is a large swathe of fabric compared to the scrappy borders either side, it needs to either stand out or blend in. 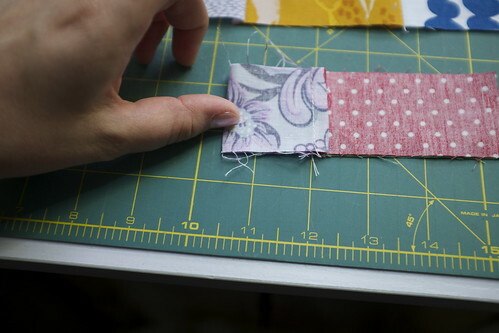 In my first Marcelle Medallion, I opted for a scrappy-looking print that exacerbated the overall scrippity-scrap look. 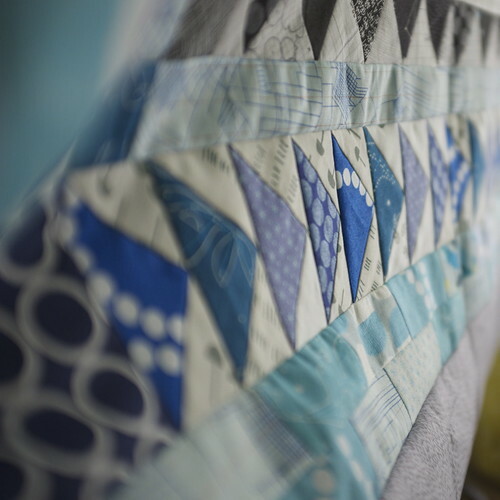 I knew that this quilt was a bit more austere, though, and since I had so much restrained scrappiness going on everywhere else, I wanted to stick to the cool, very small-print idea. I wanted a print so fine and soft that the eye could rest. White was out, and I'd used black, navy, aqua and medium blue in other places. I needed something to fill that space. Ultimately, I chose Rain Basics in grey. 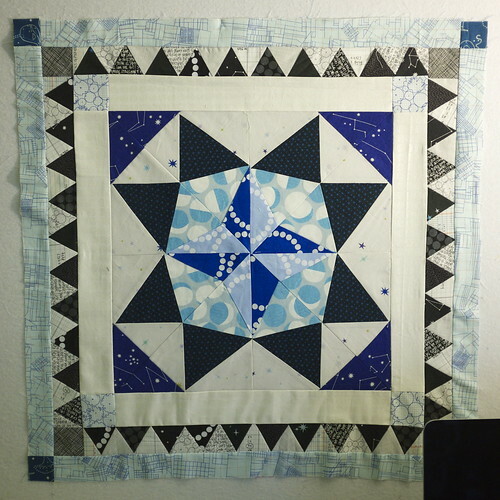 In the overall quilt, it gives a place to pause, visually. It stops you before your eye roves to those scrappy outer borders and lets you have a little rest. Like a rainy day does. Enforced calm. Ahhh. 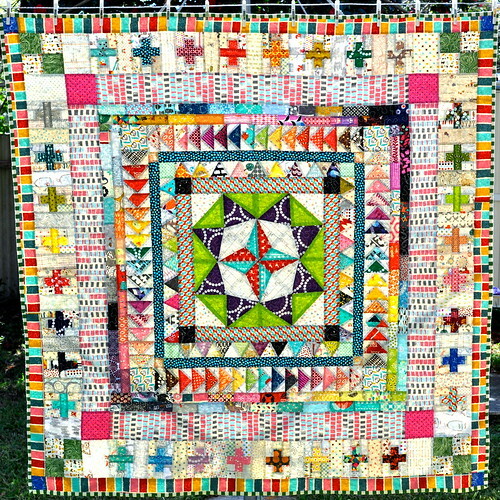 Now, I have seen a few others doing amazing things with their sixth border...I am jealous of their fabric stash and of their boldness and brilliance! Check these out. Mary on Lake Pulaski - love the gorgeous vintage vibe of this one! 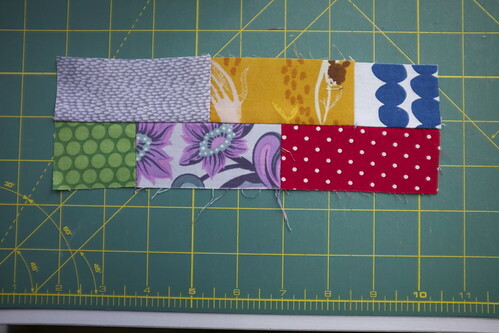 Deb - this bright blue border adds zingy interest and makes the orange patchwork pop! Jess at The Elven Garden - I love this AMH border, it's like its own patchwork here! 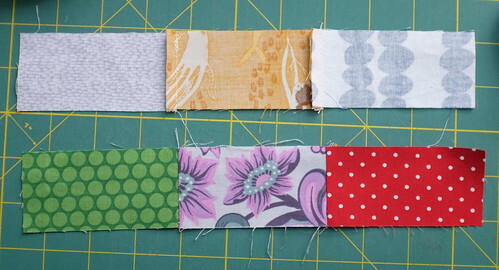 By the time I got to Border 7, I knew I would have plenty of scraps. And hoo boy, did I ever. 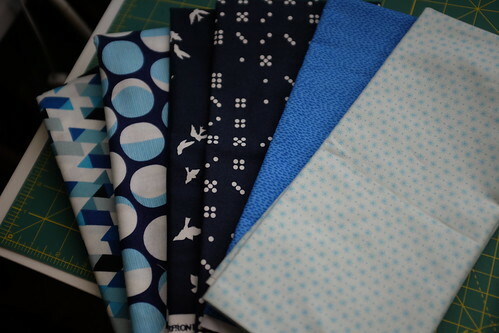 I narrowed my scraps down to four feature fabrics in nearly the same color range - there are three different medium blues and one black with blue accents! I wanted mainly the best constrast between my crosses and the background as I could get. I also wanted to stay away from something paler - it would have been washed away by my rainy 6th border. 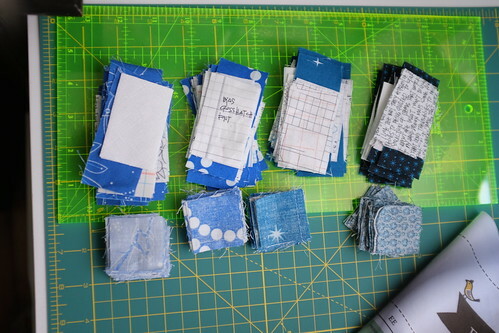 These I cut first into piles according to color, and then I sorted them into individual crosses. It was easy enough to chain piece them, as they were squares! All right! NO LINKUP this week, just because germs are gross and I have them, but I'll do TWO PRIZES next week, so look for me on Monday! And the winner was lucky number 9! Congratulations Kristy of Handmade Retro!! Your email has been sent! Can't wait to send your lovely parcel! 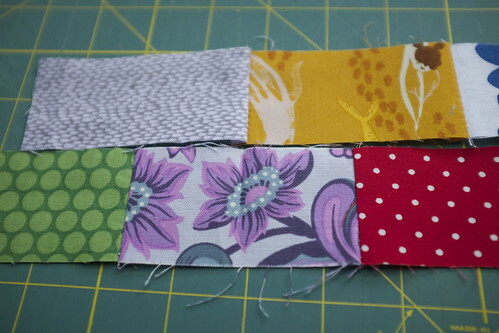 Tomorrow we'll be talking about the next border - all those tiny strips!! - and I'll be exploring a few alternative borders, too! Can't wait to see all your progress! Keep on posting on Flickr, Instagram and linking up here! I keep forgetting to update my WIP Wednesday! And I love WIP Wednesdays!! Well, it has been a busy week. 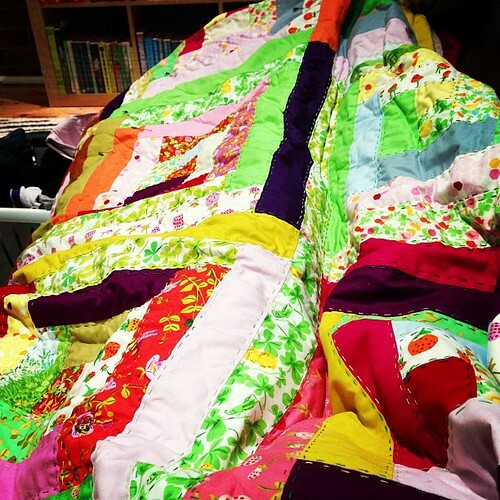 I got a bit of my sew-jo back and whipped up a cot quilt for my new little niece Lola. I have been hoarding a charm pack of Hunky Dory for two years, just waiting for the right moment. 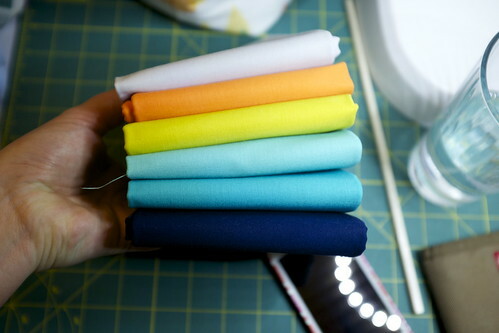 I pulled it out and found a few bright solids...then began stitching. It was done in a day. I quilted it with a simple double-loop (my favorite for little girl blankets), and bound it with some Alexander Henry Heath in pink (one of my favorite fabrics). The label is perfect to use as a handle too. Can you see "Lola" in the stitching? 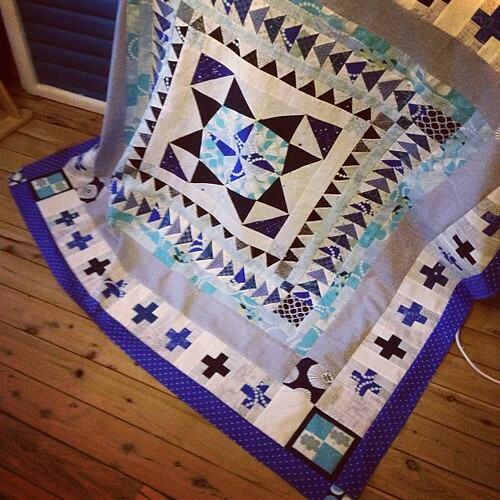 I have been working hard on the Marcelle Medallion Quilt, too! 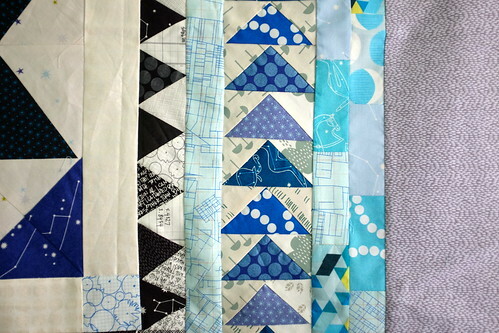 I am up to border 6, which is a little far ahead for the Quilt-Along, but I had so much fun I didn't want to stop! I love these geese flying everywhere. 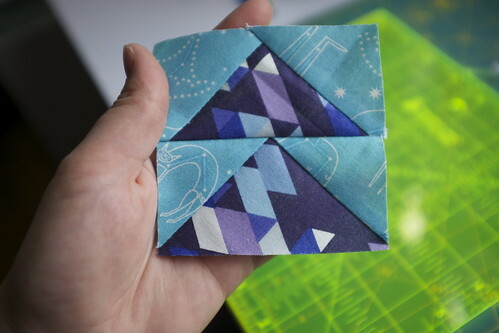 I'm about to start piecing border 7. That will start tomorrow. This month is my month for AusModBee. 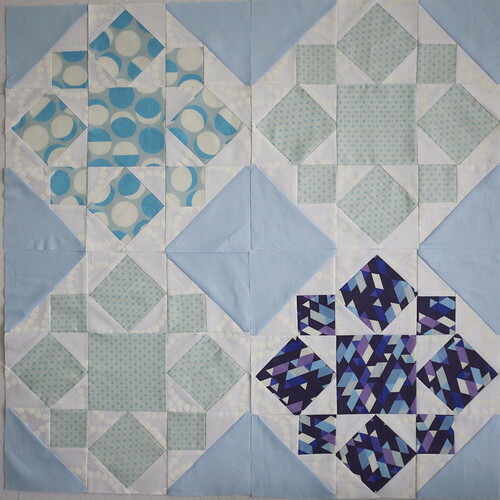 I made four blocks and will receive 26 back, so I plan to make a quilt with 30 blocks (in a 5 x 6 configuration). 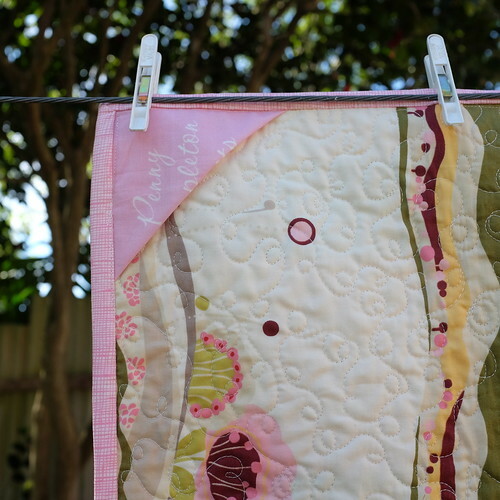 I might save this quilt top for after I buy my quilting frame. I like the look of it so much! I managed to finally make a few fabric bowls out of some extra-precious Kathrine Codega fabric. 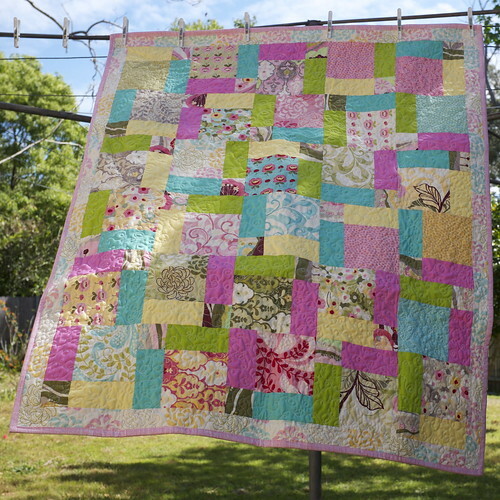 I love it, but when I used some of it on a quilt, it started fading within three washes. We use and wash our quilts a lot so I am going to use her beautiful prints in things like this, that don't get so grungy they need washing! 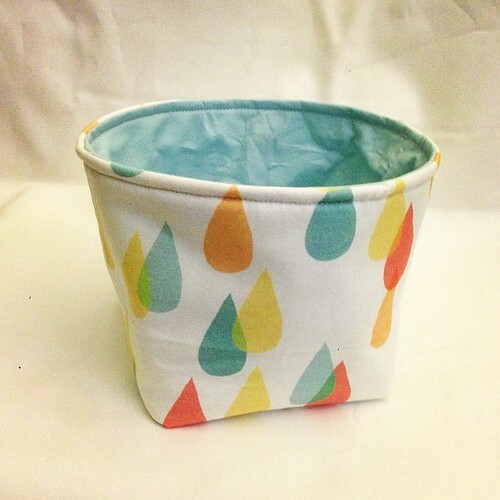 This fabric bowl is from the Nesting Bowls pattern by A Cuppa & A Catchup. 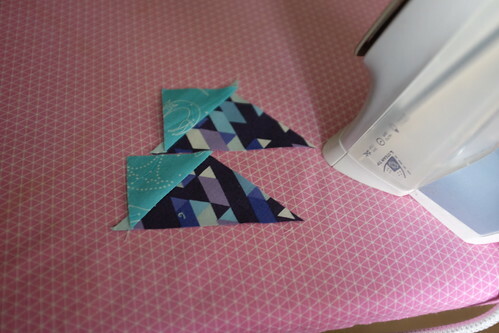 Last night we watched TV and I took a break to work on my Briar Rose log cabin quilt. I've almost got the whole middle quilted. It's a long-term project so I'm not super fussed. This isn't so much a WIP as it is a potential project...new Konas arrived from Pink Chalk this week. 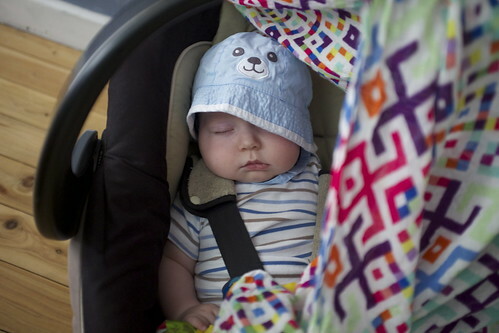 And, just for kicks... the cutest children alive. Last night during Owen's last feed before sleep I brought both my Elizabeth Hartman books into the bedroom to page through. This morning, when Piper found them, she lit up like a birthday cake. 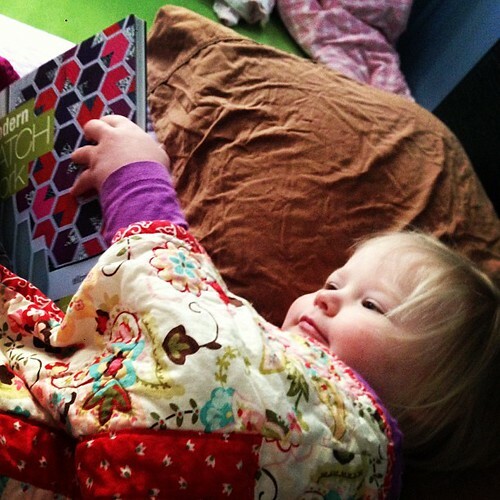 She grabbed Modern Patchwork, cuddled up under our quilt, and opened it up. Last week we talked about cutting the flying geese for border number four. 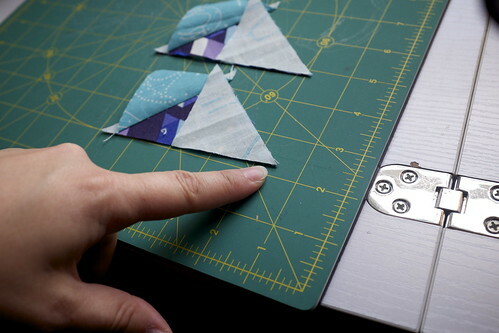 Now we're going to talk about chain-piecing your cut triangles to make the flying geese units (FGUs). 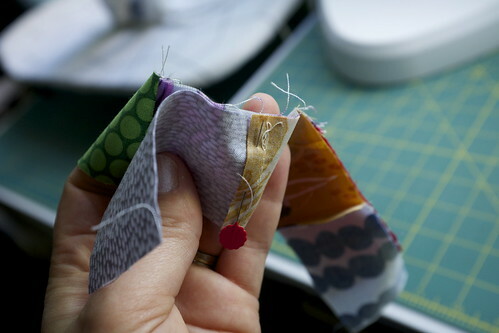 I've had reports of varying success using a scant seam versus a true seam. For me, both times (on two different machines), scant worked well. I will talk a little bit about how big they need to be in a moment, but I'd love to hear your feedback! 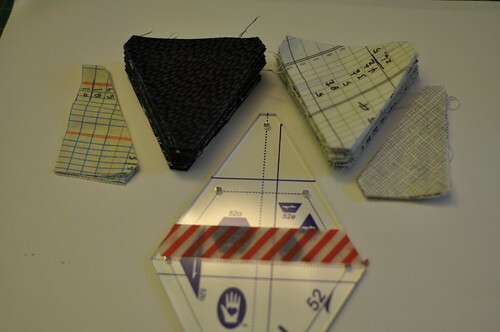 So, gather up your triangles, two little ones for each big one. 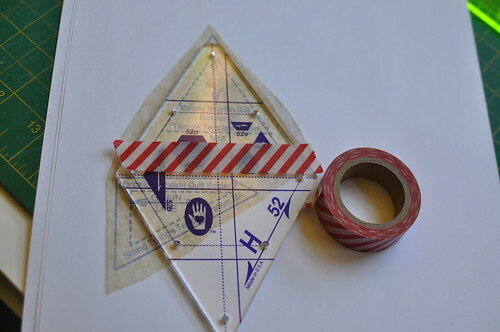 Find the right angle of the smaller triangle and line it up with the longest side of your larger triangle (this is called the hypotenuse). Make sure your points match up. 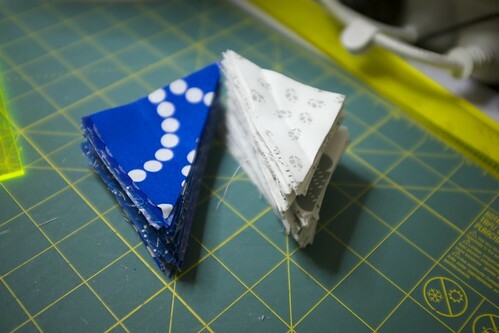 I like to chain piece these slowly, adding a small triangle to the larger one before I feed each one in. It's slower going but it's very accurate and still chain piecing (which makes it speedier than making the individual units). Carefully press these outward. 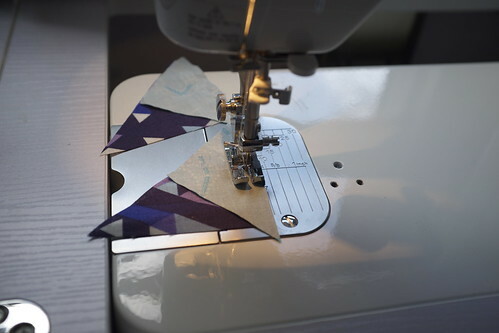 I always, ALWAYS press the seams to one side on flying geese, and it is always outward toward the smaller triangle. 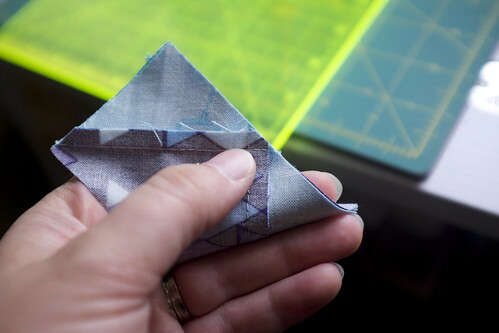 Now get your other small triangle and repeat the right-angle against the hypotenuse, making sure those points match up (I'm pointing to them). 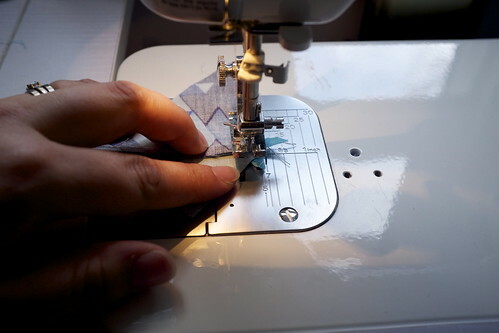 Sew sew sew. 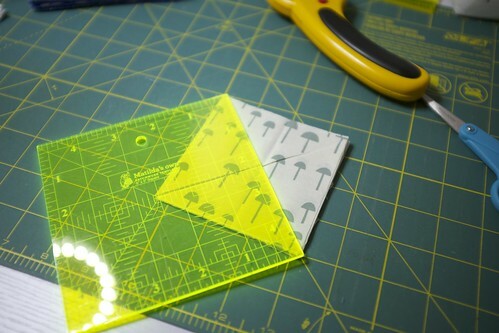 (That, by the way, is a scant 1/4" foot for my Juki. It's okay. I should review it later.) 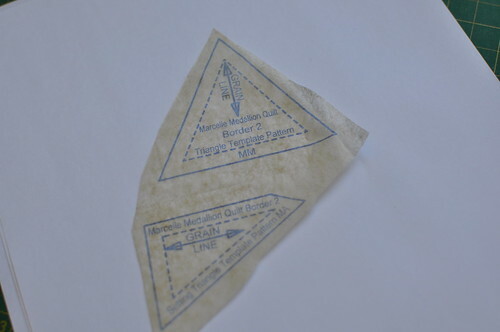 If you look carefully you can see that the stitching line will come out exactly at the intersection of the tag and the FGU. You can chain piece these too. I didn't bother trimming mine (!) because I knew they were pretty accurate, so I just snipped the tags off and evened up any really wonky edges with scissors. IF YOU DO TRIM YOURS, they need to be the width of the cornerstone block. Flying geese height is width ÷ 2 + .25". So if you had a FGU of 6.5" width, the height would be 6.5" ÷ 2 = 3.25" + .25" = 3.5". 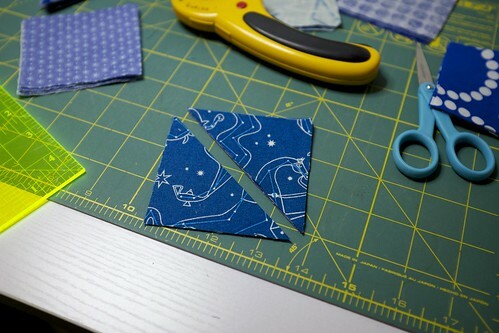 Sew them together, and press. I always press the point upward, so the hypotenuse end of the FGU is pressed under the one directly below it. I hope that makes sense - I am regretting not taking a picture of the back now! 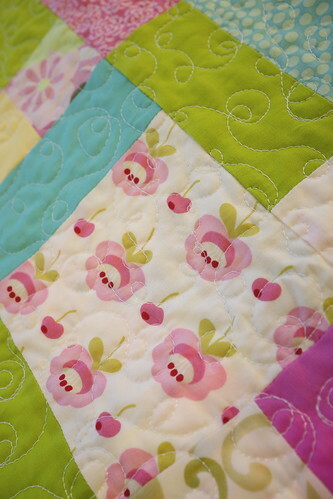 This is a sneaky sneak peek of where I am at with my quilt top. So far I am pretty impressed that my points are as nice as they are - I blitzed through this border Sunday night while my husband was watching a movie behind me! This week's giveaway is pretty sweet - two books, Treasures from the '30s and Link to the 30s, plus a charm pack of Briar Rose and a mini rounded dresden template set (4" - 9")! All you have to do to be eligible to link up down below! Here is the linky, and I can't wait to see how you are all going!! This week's giveaway was provided by the lovely Samantha at Pattern Crush - a half yard bundle of Dem Bones by Sarah Watson for Cloud 9 Organics! This week's winner is lucky unmber 13, ChelsieCreates! Congrats ChelsieCreates! We'll have that half yard bundle in the post for you ASAP! See you all tomorrow for part II of our tricksy border 4! This week we tackle a slightly scary border. So scary, in fact, there are two weeks alloted for this border...one for cutting, and one for piecing! 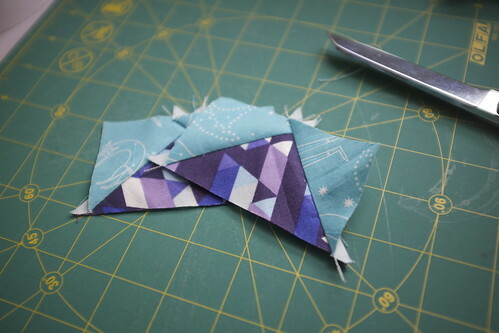 As you can see, I am up to border 3, and am ready to start my flying geese! 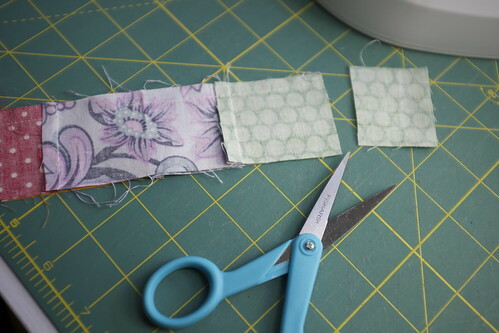 Firstly, there are several ways to make this border, but I am going to illustrate how I cut it (according to the book)! In order to accurately piece this, it must be accurately cut. 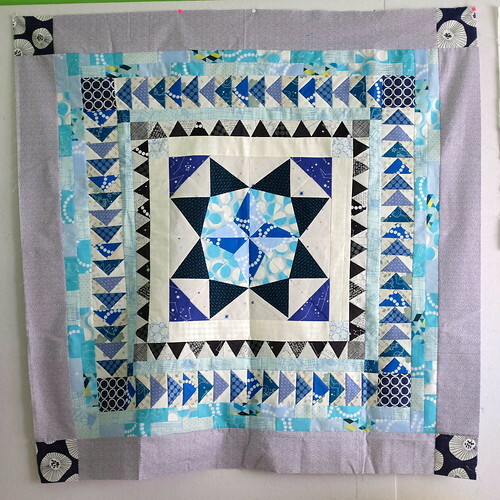 This block is so teensy that it needs definite care! 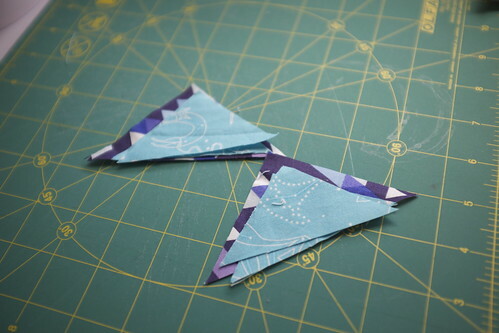 I chose to use a bright medium blue for my geese centers, and low-volume fabric as my geese corners. 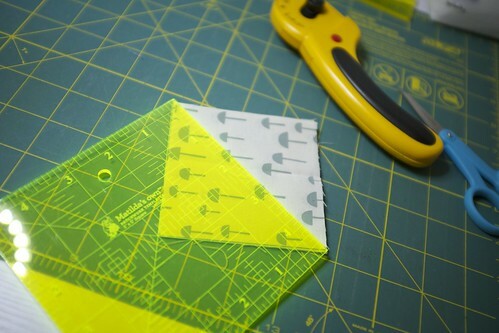 I cut the fabric to the directions in the book, in squares. 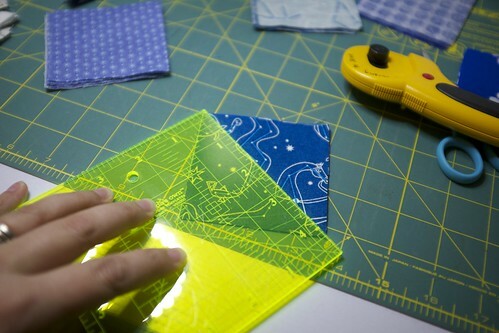 Then I lined the top edge of the main fabric square up with the 45º angle on my ruler. I made sure my points were exact! 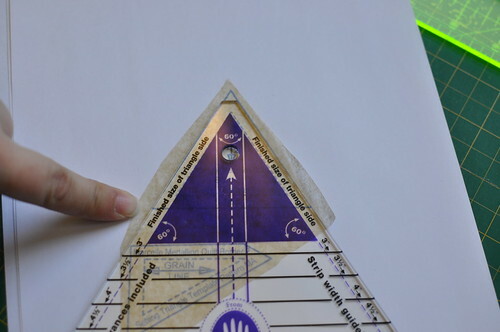 Then you cut along the ruler line. 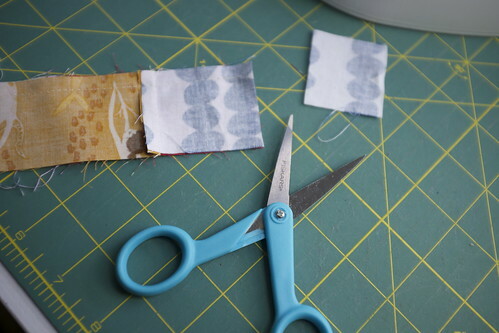 I try to cut four or fewer at a time. Any more and you'll definitely lose accuracy. 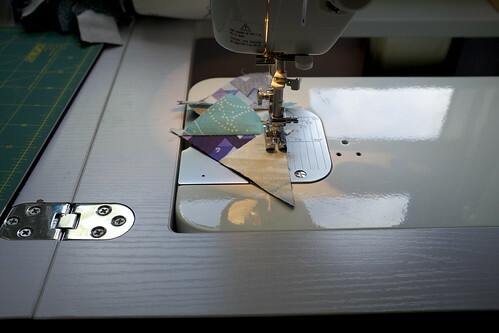 Cutting two at once would be even cleverer, but I'm pretty confident in my rotary cutting skills by this point! 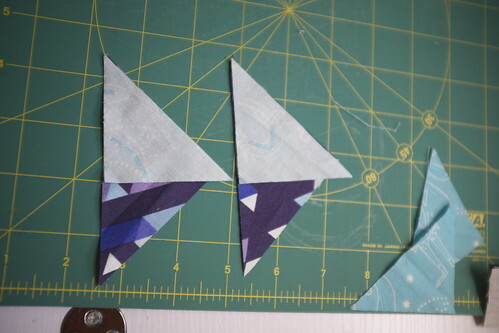 Next up are the background triangles. 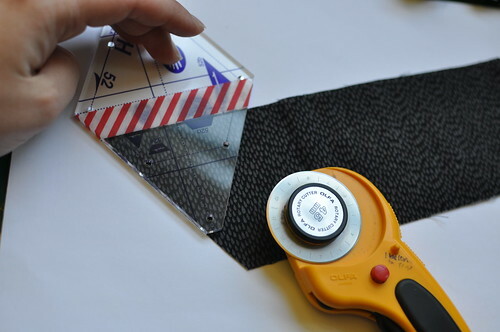 You will do the same, lining the top of the square against the 45º line, then cutting across the diagonal. Only this time you will carefully turn your ruler (and yourself, be safe!) 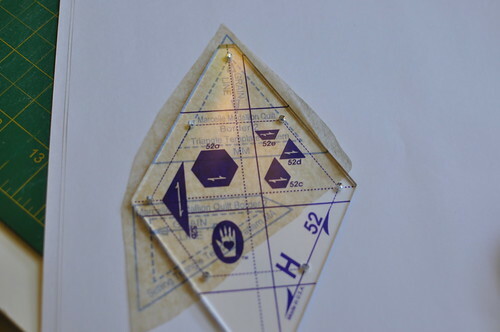 and you will line the left hand side of the square up against your 45º line, crossing over the existing cut. 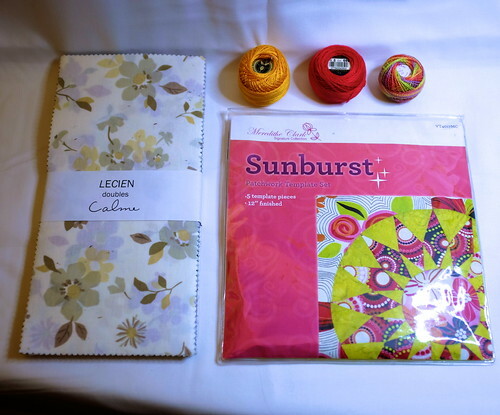 Now, next week there's a fabulous prize donated by the amazing Samantha at Pattern Crush. 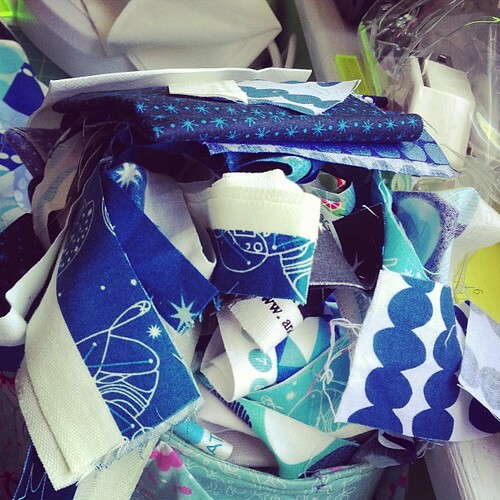 She is offering this gorgeous half-yard bundle of Dem Bones by Sarah Watson for Cloud 9 Organic. All you need to do to be eligible for the prize is to link up with a progress shot and let everyone see how you're going! Can't wait to see how everyone is going!! It's winner time! 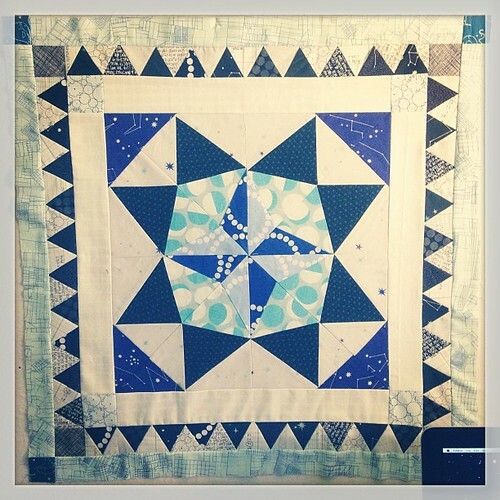 Last week we went over 60º triangles and many of you linked up to show your gorgeous progress! Number six is Lisa at Modern Balabusta! The email has been sent and soon she shall have all this fabulous swag!